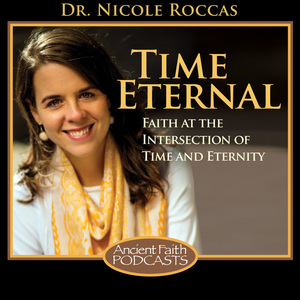 As I announced earlier, today marks the beginning of a new series within Time Eternal that focuses on the liturgical year. Welcome to “A Year in Time”! And welcome to a New (ecclesiastical) Year! On September 1st, we also enter into a new ecclesiastical year in the Orthodox Church–a fitting “time” to start thinking anew about time and all the ways it’s bound up with worship, liturgy and salvation. So let’s talk about this New Year. Sometimes this is also called the Indiction (we’ll talk about why below). Whatever terminology you prefer, it’s the point in the calendar when the cycle of fixed feast days begins anew. This is most clearly seen in the narrative arc created by the twelve major feast days of the Orthodox Church. Prior to September 1, the last of these feasts we celebrate is the Dormition of the Theotokos (August 15). Immediately following the ecclesiastical New Year, we will commemorate the birth of the Theotokos (September 8). In other words, bookending the Church year are the beginning and end of the Theotokos’ life on earth. This parallels in temporal terms the Christological significance of the mother of God—just as she bore Christ in her womb, her lifespan “bears” Christ in liturgical time. Spoiler alert: as you’ve probably noticed, within these “bookends” of the Church year, not everything flows chronologically through the year. Mostly, it does proceed logically through the birth, life, death and resurrection of Christ, but there are some notable exceptions. For example, the feast of the Transfiguration of Christ (6 August) always occurs after Pascha. For now, let’s return to the Church New Year. The short answer is that this was the civil New Year in the eastern Roman Empire and, eventually, the Byzantine empire. Among other things, tax payments were calculated from this date and it makes sense for the Church to conform itself to this norm. But there’s a longer story, too. We could title it “More than You Ever Wanted to Know about the Ecclesiastical New Year.” Also, it may cause temporal vertigo. We’ll start in the Roman Empire around the time of Christ. It was a land of many New Year’s dates. In some provinces of the Western part of the empire, New Year’s was set to January 1st, which coincided with the end of the pagan Saturnalia games of late December. But in certain eastern provinces, the new year was set on September 23rd—the birthday of Caesar Augustus (d. AD 14), founder of the Roman Empire. In those days, the new year served two basic purposes. I’ve already mentioned its role in yearly taxes. But every 15 years, the new year also signaled the start of a new Indiction, i.e. a new period of tax assessment. Every fifteen years, the tax rates would be reset based on new population levels and other factors. Sounds kind of boring, but these Indictions were important for reasons other than taxes. Here, we have to remember that there was yet no universal reference point for signalling your place within a given era. Today, we use the Anno Domini system (AD, or CE) to mark the number of years (this year is AD 2016, for example). 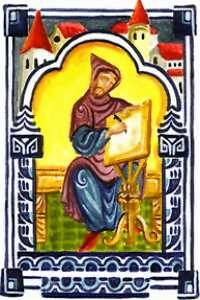 But this system wasn’t implemented until the sixth century, when St. Dionysius Exiguus (aka Dionysius the Humble)—a scythian monk—came up with a new computation for a possible year when Christ had been born. St. Dionysius the Humble (d. 544) inaugurated Anno Domini years while calculating the date of Easter. Prior to the Anno Domini years, one of the ways people gauged their year in time was with indictions—the first year after an indiction was “first indiction,” the second year was “second indiction,” and so forth. Unfortunately, they didn’t number the indictions themselves, so each Indiction was its own new era. But hey, something was better than nothing, right? So, when you wrote the date on official documents, you’d write the calendar date plus the numbered year within the current indiction cycle, a written formula that later became compulsory in the Byzantine Empire. Whatever the case, 1 September became the “new” new year in the territories of the emerging Byzantine empire. It also became the New Year of the Church. For most of us, September 1st doesn’t ring any huge spiritual bells—we’re busy getting ready for school to begin again or traveling for labor day. It falls off our radar, too, because many parishes don’t have a special service to commemorate this time in the Church. There’s no procession, there’s no great feast to mark the turning of one year into the next. And yet, I think we can see September 1 as a time the Church signals us to begin anew. Any kind of new year—whether civil or ecclesiastical—is an invitation to extricate ourselves from the loop of time temporarily. As we transition to a new year, we have the sense of stepping out of the old and into the new. Of stopping the normal, ongoing flow of time. I think this is why people are inclined to make resolutions on January 1st. Stepping outside the endless loop of time makes us feel like we can exit the circuit of our own vices and bad habits. Perhaps fittingly, the Church observes numerous other typological new “Beginnings” on this date. If you attend a matins service on September 1st, you will likely hear that today, we commemorate the entrance of Christ into the Synagogue to announce His mission to mankind (Luke 4:16-22). Likewise, in keeping with a Talmudic tradition, it is also believed that the Hebrews entered the Promised Land at the beginning of September. These events, like the start of a new year, invite us out of the staleness of old existence and into the promise of newness, the hope of salvation. For me, September 1st provides a juncture at which to rekindle the discipline of gratitude. 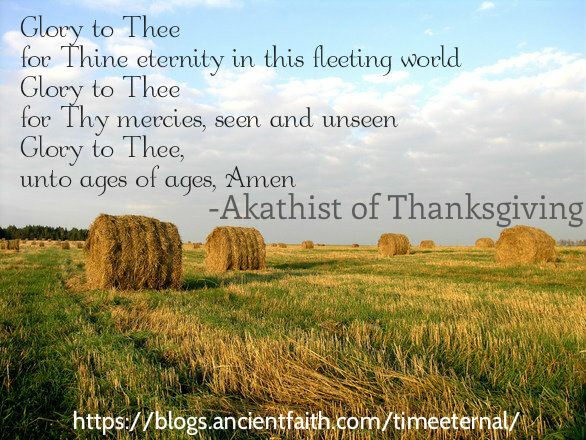 A parish I used to attend started a beautiful custom of celebrating the Akathist of Thanksgiving (aka “Glory to God for All Things”) on the eve of September 1st each year. Written in the midst of the persecutions that followed the Bolshevik Revolution in Russia, it’s a humbling and moving cycle of hymns that praise God for all manner of events in our lives and in the life of the world. Sadly, I moved away and am no longer able to attend this parish, and haven’t ever come across another church that does this. But I’ve started reading through this Akathist on my own or with family whenever September 1st rolls around. Glory to Thee, O God, from age to age. This is just the beginning of a beautiful–and dare I say timely–Akathist. I invite you to join me in making its words our own as we begin this new year. May we move forward in gratitude and peace. Happy New Year! I could not be more excited that Time Eternal is now a blog. I have thoroughly enjoyed your podcast and am adding these words of yours to my list of things to be grateful for this year. Thanks for your kind words, Michelle! I’m also grateful for this chance to come in contact with others who are also encouraged by learning and thinking about time and eternity. May God bless your year. Happy New Ecclesiastical Year! May God bless you and your work. I’ve always listened to your podcasts with interest…..and now a blog…..I prefer it more when it is in written form…….it gives you Time to think………so glad for this new blog. Thank you, Sophia! It’s great to hear from you. Thanks for stopping by and may God bless your time. I look forward to your future writings. Your work has changed my understanding of the mystery of time. My hope is you will provide insight to the lost beauty (and meaning) of the church calendar cycle. I like that, “lost beauty.” 🙂 Thanks for writing. Hi Nicole. I listened to your podcast on this topic, too, and found it fascinating. I wonder if you plan to explore any of the connections between the cycle of the seasons and the Christian year. The natural cycle is one of the most immediate, physical reminders of the passing of time, and both civil and religious calendars seem to have an interplay with it. The birthday of Caesar Augustus is of course the fall equinox and is now when we celebrate the conception of St. John the Forerunner (and is also near the Jewish New Year where they commemorate the creation of the world). Christmas is right near the solstice. Annunciation is right near the spring equinox. The birth of St. John is right near the summer solstice. We bless candles in February, right as we begin to notice the longer, lighter days that foretell spring. We bless grapes and flowers and honey at the August feast days, at harvest time. There seems to be a beautiful synthesis of the passing of time–the seasons and the bounty of Gods creation–with liturgical practice and the calendar in our Orthodox traditions. Everything is God’s and is transformed in Christ. I would love to learn more about these connections as you continue on your exploration of the church year! Oh wonderful! Thanks for your reply. Can’t wait!